The Great Crown of Victory (Thai: พระมหาพิชัยมงกุฏ; RTGS: Phra Maha Phichai Mongkut) is part of the Regalia of Thailand. Made of gold in the reign of King Rama I in 1782, the crown is 26" (66 centimeters) high and weighs 16 lb (7.3 kg), and enamelled in red and green. Thanks to King Rama IV, the crown is also set in diamonds. He added a large cut diamond from India to decorate the top of the crown, called Great Diamond (พระมหาวิเชียรมณี Phra Maha Wichian Mani). The crown is of a distinctive Thai design, being a multi-tiered conical diadem, terminating in a tapering spire. A king only wears the crown during his coronation, where he places the crown on his own head. The shape of the crown represents the concept of divine monarchy. The tall spire represents divine authority and right to rule over the people. Currently, the Great Crown of Victory is the most important of the five regalia of Thailand, yet once the crown possessed the same importance as any other regalia. However, it was under the influence of western culture that the king would accede to the throne when crowned, in the reign of King Rama V.
The privy seal of King Mongkut (Rama IV), depicting the Great Crown of Victory. Flag of the Minister of Defence of Thailand since 1936. A replica of the Great Crown of Victory for the mast of the royal yacht Mahachakri II, Royal Thai Naval Museum, Samut Prakan. King Bhumibol Adulyadej wearing the Great Crown of Victory on his coronation day at the Grand Palace, 5 May 1950. "The Great Crown of Victory", "exhibit" on Ratchadamnoen Avenue in Bangkok showing the Thai Regalia in honour of the 60th anniversary of King Bhumibol Adulyadej's accession to the throne in 2006. 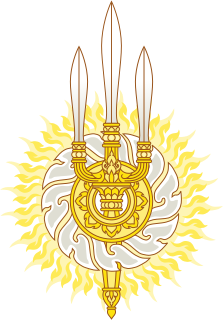 Wikimedia Commons has media related to Crowns of Thailand. The Chakri dynasty is the current ruling royal house of the Kingdom of Thailand, while the Head of the house is the monarch. The dynasty has ruled Thailand since the founding of the Rattanakosin Era and the city of Bangkok in 1782 following the end of King Taksin of Thonburi's reign, when the capital of Siam shifted to Bangkok. The royal house was founded by King Rama I, an Ayutthaya military leader of Sino-Mon descent. Bhumibol Adulyadej, conferred with the title King Bhumibol the Great in 1987, was the ninth monarch of Thailand from the Chakri dynasty as Rama IX. Reigning since 9 June 1946, he was, at the time of his death, the world's longest-reigning head of state, the longest-reigning monarch in Thai history and the longest-reigning monarch having reigned only as an adult, reigning for 70 years, 126 days. During his reign, he was served by a total of 30 prime ministers beginning with Pridi Banomyong and ending with Prayut Chan-o-cha. The Grand Palace are a complex of buildings at the heart of Bangkok, Thailand. The palace has been the official residence of the Kings of Siam since 1782. 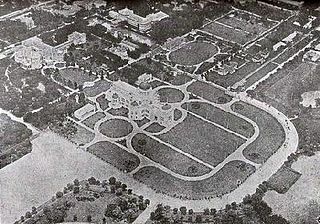 The king, his court, and his royal government were based on the grounds of the palace until 1925. King Bhumibol Adulyadej, resided at the Chitralada Royal Villa and his successor King Vajiralongkorn at the Amphorn Sathan Residential Hall, both in the Dusit Palace, but the Grand Palace is still used for official events. Several royal ceremonies and state functions are held within the walls of the palace every year. The palace is one of the most popular tourist attractions in Thailand. 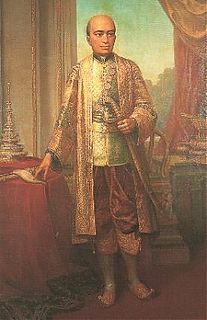 Phra Phutthaloetla Naphalai or Rama II was the second monarch of Siam under the Chakri dynasty, ruling from 1809 to 1824. In 1809, Itsarasunthon succeeded his father Rama I, the founder of Chakri dynasty, as Loetlanaphalai the King of Siam. His reign was largely peaceful, devoid of major conflicts. His reign was known as the "Golden Age of Rattanakosin Literature" as Loetlanaphalai was patron to a number of poets in his court and the King himself was a renowned poet and artist. The most notable poet in his employ was the illustrious Sunthorn Phu, the author of Phra Aphai Mani. Sri Savarindira, also known as Savang Vadhana, was a consort and half-sister of Chulalongkorn, but she was not the Rajini or the highest ranked consort. After her first grandson's accession to power in 1935, she became known as Somdetch Phra Phan Vassa Ayika Chao. All her children died before her, so she lived to see her grandsons Ananda Mahidol and Bhumibol Adulyadej take the throne. The Sixtieth Anniversary Celebrations of King Bhumibol Adulyadej's Accession to the Throne 2006 were the celebrations held throughout Thailand in 2006 to celebrate King Bhumibol Adulyadej's 60th year on the throne. The celebrations were arranged by the Royal Thai Government with Thaksin Shinawatra as Prime Minister, and joined by representatives of other monarchies. Wat Pavaranivesh Vihara Rajavaravihara is a major Buddhist temple (wat) in Phra Nakhon district, Bangkok, Thailand. It is the final resting place of King Bhumibol Adulyadej. The Royal Flags of Thailand are flags that are usually flown in Thailand along with the National flag to honor the King as well as the Royal Family of Thailand. Unlike the Royal Standards that are only displayed in special ceremonies and in particular locations, the royal flags are a ubiquitous sight all over Thailand. They are not commonly seen, however, outside of the country. The monarchy of Thailand refers to the constitutional monarchy and monarch of the Kingdom of Thailand. The King of Thailand is the head of state and head of the ruling Royal House of Chakri. The Royal Nine-Tiered Umbrella is considered the most sacred and ancient of the royal regalia of Thailand. A royal umbrella consists of many tiers, five for the crown prince, seven for an unconsecrated king, and nine for a fully sovereign Thai king. 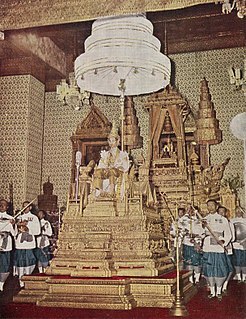 Until the coronation rites are completed the new king will not be able to sit on the throne under the nine-tiered umbrella. 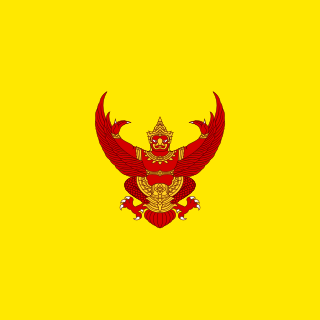 The Royal Standard of Thailand is the official flag of the King of Thailand. The standard was adopted in its present form in 1910 under King Vajiravudh, superseding the first Royal Standard created by King Mongkut in 1855. In 1979, the designs were codified by law; specifically in Article 2 of the Flag Act of 1979, which also regulated Thailand's other flags. The standard is currently used by King Maha Vajiralongkorn, also known as Rama X, since 2016. Royal residences of the Chakri Dynasty in Thailand include the Grand Palace, nineteen royal palaces and other palaces used by the king or other members of the royal family. The Bureau of the Royal Household administers and manages several current royal palaces. Historical palaces from earlier periods exist mainly in the ruins of Ayutthaya and Sukhothai. This page lists current and former royal residences, arranged by type of residence. The Amphorn Sathan Residential Hall or the Ambara Villa is a royal mansion situated inside Bangkok's Dusit Palace. It serves as the current primary residence of King Maha Vajiralongkorn of Thailand. The coronation of the Thai monarch is a ceremony in which the King of Thailand is formally consecrated by anointment and crowning. The ceremony is divided into two main events: the coronation rites and the celebration of the Assumption of the Residence. The coronation rites are a blend of Hindu and Buddhist traditions dating back several centuries. The rites included the purification bath of the king, the anointing of the king, the crowning of the king, and the investiture of the royal regalia, the royal utensils, and the royal weapons of sovereignty. The Assumption of the Residence is a private housewarming celebration by members of the royal family at the Grand Palace. The banknotes of the Thai baht are part of the physical form of Thailand's currency, Thai baht. The issuance of the baht banknotes is managed by the Bank of Thailand. Throughout its history, the denominations have ranged from 1 baht to 100,000 baht. The circulating banknotes today in Thailand, however, are ranged from 20 baht, 50 baht, 100 baht, 500 baht and 1000 baht. The currently circulating series are 17th, 16th and 15th series. Thai baht banknotes commonly include the portrait or the picture of the sculpture of its kings. The obverses have been designed with the current king's portrait. Whilst, in the reverses, mostly the picture of notable kings and kings with the title "the great". Some reverses feature the King Bhumibol's sayings. The coronation of King Vajiralongkorn is scheduled to take place on 4 May 2019 at the Grand Palace, Bangkok, Thailand. Vajiralongkorn ascended the throne at the age of 64 upon the death of his father, Bhumibol Adulyadej, on 13 October 2016, accepting the accession invitation by Prem Tinsulanonda, president of Privy Council, on 1 December 2016. The coronation will be held within just two years after his accession to the throne in 2016 because of an appropriate length of time to pass after the death and funeral of Bhumibol Adulyadej and arrangement of the ceremony after the last such rite being held in 1950.